3 PROPERTIES OF MATERIALS Elasticity Elasticity of a material is its power of coming back to its original position after deformation when the stress or load is removed. Elasticity is a tensile property of its material. The greatest stress that a material can endure without taking up some permanent set is called elastic limit (Point a) Stiffness (Rigidity) The resistance of a material to deflection is called stiffness or rigidity. Steel is stiffer or more rigid than aluminium. Stiffness is measured by Young s modulus E. The higher the value of the Young s modulus, the stiffer the material. E is the ratio of stress over strain and is given by the slope of line 0-a Plasticity The plasticity of a material is its ability to undergo some degree of permanent deformation without failure. Plastic deformation will take place only after the elastic range has been exceeded, beyond point b. Plasticity is an important property and widely used in several mechanical processes like forming, shaping, extruding and many other hot and cold working processes. In general, plasticity increases with increasing temperature and is a favourable property of material for secondary forming processes. Due to this properties various metal can be transformed into different products of required shape and size. This conversion into desired shape and size is effected either by the application of pressure, heat or both Ductility Ductility of a material enables it to draw out into thin wire on application of the load. Mild steel is a ductile material. The wires of gold, silver, copper, aluminium, etc. are drawn by extrusion or by pulling through a hole in a die due to the ductile property. The ductility decreases with increase of temperature. The per cent elongation and the reduction in area in tension is often used as empirical measures of ductility Malleability Malleability of a material is its ability to be flattened into thin sheets without cracking by hot or cold working. Aluminium, copper, tin, lead, steel, etc. are malleable metals. Lead can be readily rolled and hammered into thin sheets but can not be drawn into wire. 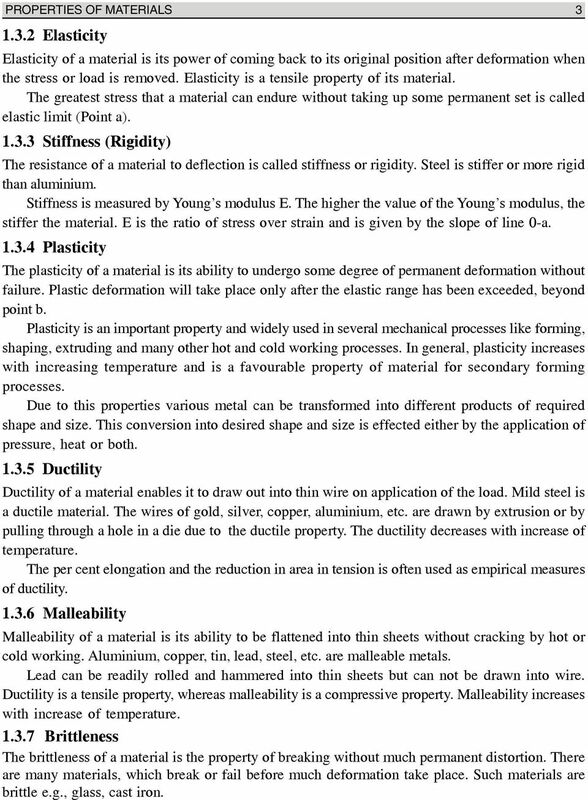 Ductility is a tensile property, whereas malleability is a compressive property. Malleability increases with increase of temperature Brittleness The brittleness of a material is the property of breaking without much permanent distortion. There are many materials, which break or fail before much deformation take place. Such materials are brittle e.g., glass, cast iron. 4 4 MANUFACTURING PROCESS Therefore, a non-ductile material is said to be a brittle material. Usually the tensile strength of brittle materials is only a fraction of their compressive strength. A brittle material should not be considered as lacking in strength. It only shows the lack of plasticity. 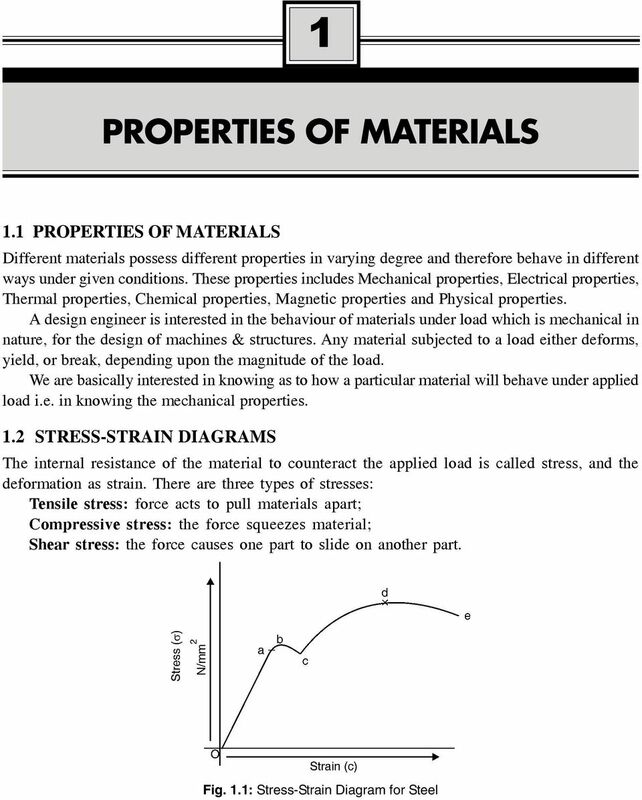 On stress-strain diagram, these materials don t have yield point and value of E is small Toughness The toughness of a material is its ability to withstand both plastic and elastic deformations. It is a highly desirable quality for structural and machine parts to withstand shock and vibration. Manganese steel, wrought iron, mild steels are tough materials. For Ex: If a load is suddenly applied to a piece of mild steel and then to a piece of glass the mild steel will absorb much more energy before failure occurs. Thus, mild steel is said to be much tougher than a glass. 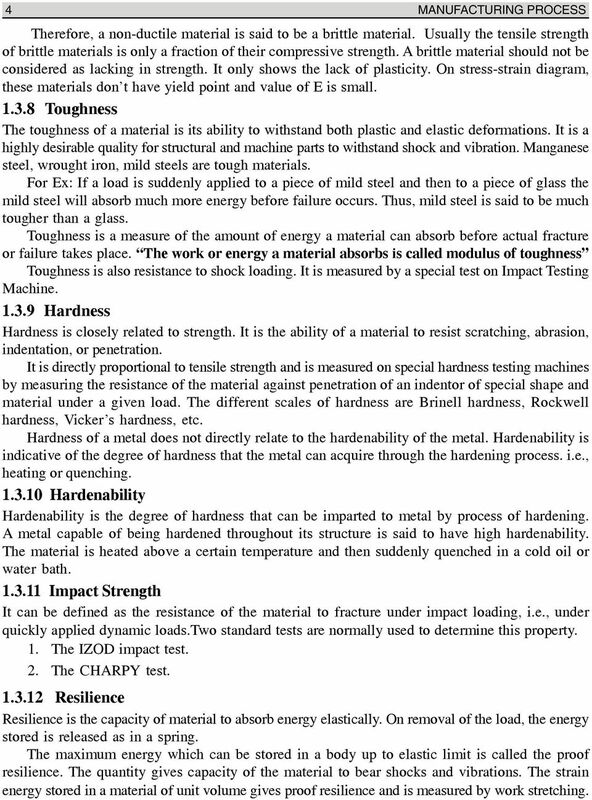 Toughness is a measure of the amount of energy a material can absorb before actual fracture or failure takes place. The work or energy a material absorbs is called modulus of toughness Toughness is also resistance to shock loading. It is measured by a special test on Impact Testing Machine Hardness Hardness is closely related to strength. It is the ability of a material to resist scratching, abrasion, indentation, or penetration. It is directly proportional to tensile strength and is measured on special hardness testing machines by measuring the resistance of the material against penetration of an indentor of special shape and material under a given load. The different scales of hardness are Brinell hardness, Rockwell hardness, Vicker s hardness, etc. Hardness of a metal does not directly relate to the hardenability of the metal. Hardenability is indicative of the degree of hardness that the metal can acquire through the hardening process. i.e., heating or quenching Hardenability Hardenability is the degree of hardness that can be imparted to metal by process of hardening. A metal capable of being hardened throughout its structure is said to have high hardenability. The material is heated above a certain temperature and then suddenly quenched in a cold oil or water bath Impact Strength It can be defined as the resistance of the material to fracture under impact loading, i.e., under quickly applied dynamic loads.two standard tests are normally used to determine this property. 1. The IZOD impact test. 2. The CHARPY test Resilience Resilience is the capacity of material to absorb energy elastically. On removal of the load, the energy stored is released as in a spring. The maximum energy which can be stored in a body up to elastic limit is called the proof resilience. The quantity gives capacity of the material to bear shocks and vibrations. The strain energy stored in a material of unit volume gives proof resilience and is measured by work stretching. 5 PROPERTIES OF MATERIALS FATIGUE AND FATIGUE TEST The fatigue strength of a material is the maximum stress at which failure may occur after a certain number of cyclic load applications. A component is designed to give a certain length of service under a specified loading cycle. Many components of high speed aero and turbine engines are designed for fatigue strength. The fatigue strength or endurance limit of material is used in the design of parts subjected to repeated alternating stresses over an extended period of time. Specimens are tested to failure using different loads. The number of cycles is noted for each load. The results of such tests are plotted as graphs of applied stress against the logarithm of the number of cycles of failure. The curve is known as S-N curve. The tests are carried out on special fatigue testing machines. (N = No. of cycles before failure) Fig. 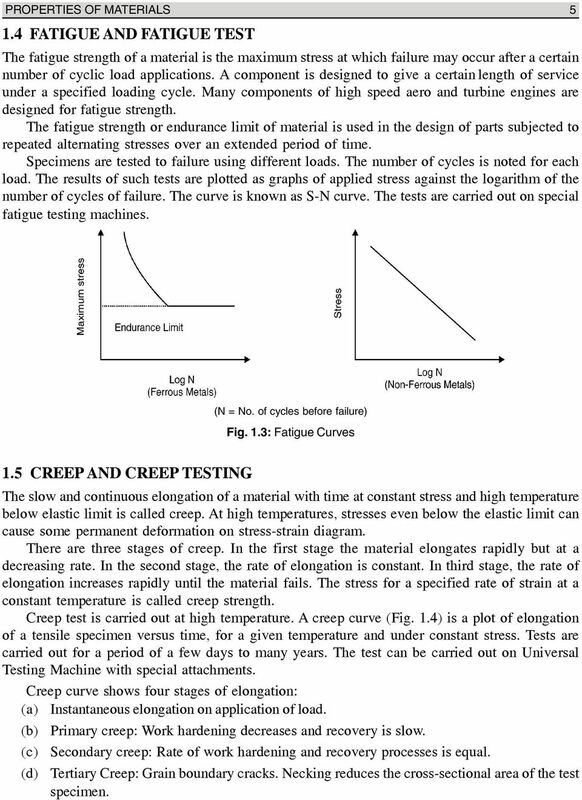 1.3: Fatigue Curves 1.5 CREEP AND CREEP TESTING The slow and continuous elongation of a material with time at constant stress and high temperature below elastic limit is called creep. At high temperatures, stresses even below the elastic limit can cause some permanent deformation on stress-strain diagram. There are three stages of creep. In the first stage the material elongates rapidly but at a decreasing rate. In the second stage, the rate of elongation is constant. In third stage, the rate of elongation increases rapidly until the material fails. The stress for a specified rate of strain at a constant temperature is called creep strength. Creep test is carried out at high temperature. A creep curve (Fig. 1.4) is a plot of elongation of a tensile specimen versus time, for a given temperature and under constant stress. Tests are carried out for a period of a few days to many years. The test can be carried out on Universal Testing Machine with special attachments. Creep curve shows four stages of elongation: (a) Instantaneous elongation on application of load. (b) Primary creep: Work hardening decreases and recovery is slow. (c) Secondary creep: Rate of work hardening and recovery processes is equal. (d) Tertiary Creep: Grain boundary cracks. Necking reduces the cross-sectional area of the test specimen. 7 PROPERTIES OF MATERIALS 7 components, selected at random, will suit the assembly condition to meet the requirement of operation. For this, the components are allowed a predetermined amount of variation in their finished dimensions lie within these limits are acceptable components.this facilitates easy and quicker production, easy inspection, requires less skill on the part of worker and accommodates a slight inaccuracy in the machine as well, resulting in an overall reduction in the production cost of the component Mechanization It is the term which implies a trends towards minimizing the human efforts, to the extent it is possible, by adopting mechanical means or methods for different processes. Such a trend may be in material handling, loading and unloading of components. Actual operations done on the job or transporation, etc. But no feed back is provided by the process, operations or machine Automation It is a further extension of mechanization and involves adoption of automatic controls for the operations of different machines. This automatic control may be adopted for only a few operation or all the operation of a m/c and accordingly the m/c will be known as Semi-automatic or Fully-automatic Computer Aided Design(CAD) The CAD enables design engineers to rough out a particular product configuration and receive immediate feedback on its specification. In utilizing CAD, the computer draws pictures on the video screen. So, CAD can speed up the normally slow and laborious work of drafting Computer Aided Manufacturing(CAM) We have studied that the CAD function of their application fully takes care of product design, product research and analysis, preparation of assembly drawings, part drawings, bill of materials, make or buy decision, etc. 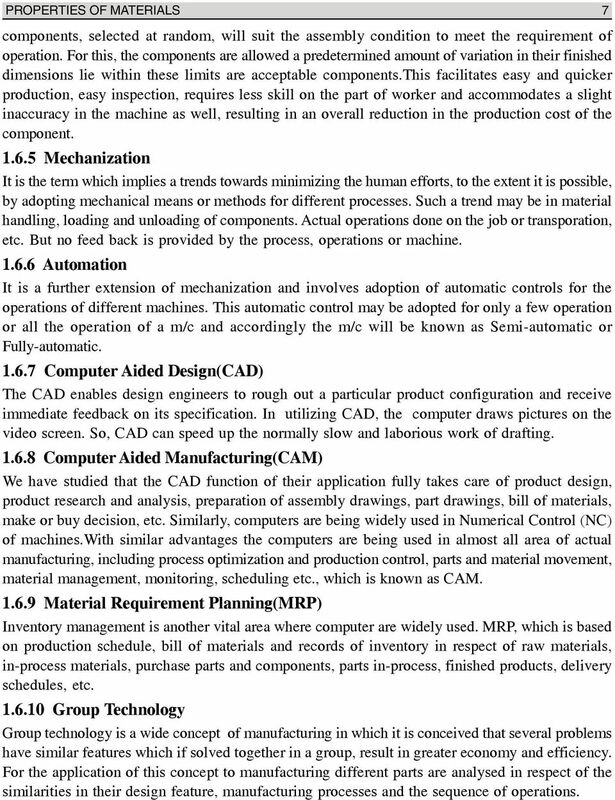 Similarly, computers are being widely used in Numerical Control (NC) of machines.with similar advantages the computers are being used in almost all area of actual manufacturing, including process optimization and production control, parts and material movement, material management, monitoring, scheduling etc., which is known as CAM Material Requirement Planning(MRP) Inventory management is another vital area where computer are widely used. 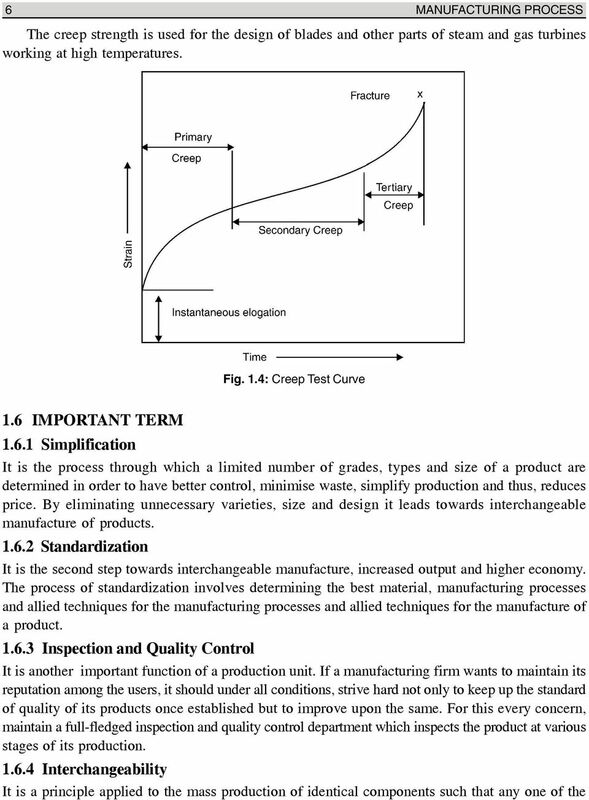 MRP, which is based on production schedule, bill of materials and records of inventory in respect of raw materials, in-process materials, purchase parts and components, parts in-process, finished products, delivery schedules, etc Group Technology Group technology is a wide concept of manufacturing in which it is conceived that several problems have similar features which if solved together in a group, result in greater economy and efficiency. For the application of this concept to manufacturing different parts are analysed in respect of the similarities in their design feature, manufacturing processes and the sequence of operations. Objectives. Experimentally determine the yield strength, tensile strength, and modules of elasticity and ductility of given materials. Chapter Outline. 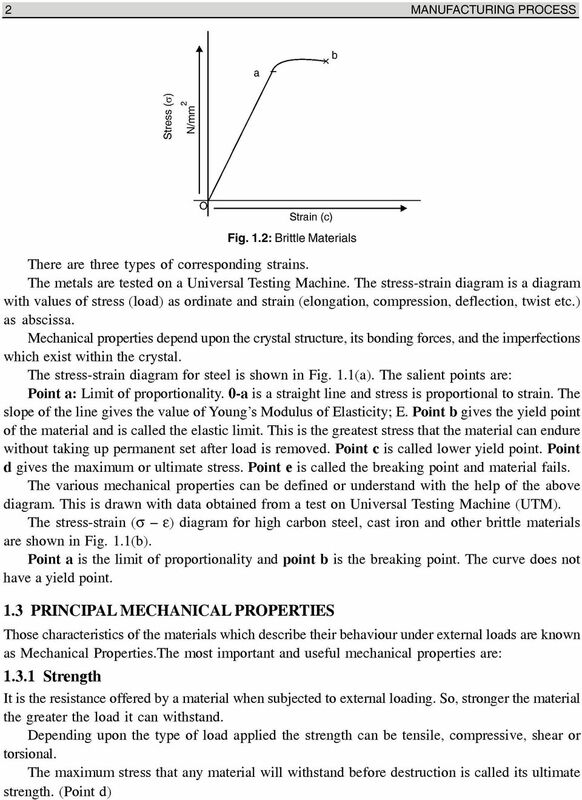 Mechanical Properties of Metals How do metals respond to external loads? CH 6: Fatigue Failure Resulting from Variable Loading Some machine elements are subjected to static loads and for such elements static failure theories are used to predict failure (yielding or fracture). Mechanical Properties and Fracture Analysis of Glass. David Dutt Chromaglass, Inc.
Unit 6: EXTRUSION. Difficult to form metals like stainless steels, nickel based alloys and high temperature metals can also be extruded. different levels, also called repeated, alternating, or fluctuating stresses. What are Properties and Working Characteristics? 14:440:407 Ch6 Question 6.3: A specimen of aluminum having a rectangular cross section 10 mm 12.7 mm (0.4 in. 0.5 in.) is pulled in tension with 35,500 N (8000 lb f ) force, producing only elastic deformation. , to obtain a way to calculate stress from the energy function U(r).